Marketing agencies work towards growing a business and reaching its highest potential. Optimizing the exposure of any business can extend its reach to potential customers and therefore raises the likelihood of interest in the product or service being offered. This is done through simplifying a business’ mission to attract audience. Marketing agencies uss various strategies and design such as digital marketing, telemarketing and consultation in marketing communications. Ultimately, marketing agencies inspire the public and its partners in continually redefining itself in fresh ways. 23e2 Business services – rated as one of Toronto’s Top 3 Advertising agencies based on a 50-point inspection by Three Best Rated®. 23e2 Business Services has been providing consistent excellence in marketing. More than just an advertising agency, 23e2 Business Services also provides Google Street View, Website design and optimization, Website hosting, social media campaigns, Google Ads management, Search Engine Optimization and Content Marketing. 23e2 Business Services exceeds TBR standards thus being named one of the Top 3 Advertising agency in Toronto. 23e2 has also launched a service aptly named Google Local Services management in which we will assist clients to advertise their businesses on Google and receive leads directly from potential customers. Potential customers can search on Google a service needed and the location at which they are situated, then they will be taken to a separate results page where they will see a list of all the participating local services businesses. The list will include a Google guarantee badge that ensures Google has certified that the business is legitimate. By using the Local Services app, business owners themselves can reply to messages, manage leads, track bookings, manage campaigns and budget, and view an ad’s performance and review ratings. What makes this service cost-effective is that business owners will only pay for the number of leads they gain as a result of having advertised their business using this service. Therefore, business owners can focus on quality, increasing their 5-star ratings and reviews and allow them the ability to connect with customers at the moment they are looking for services. No more wasting time at chasing customers and more chances at turning leads into customers. 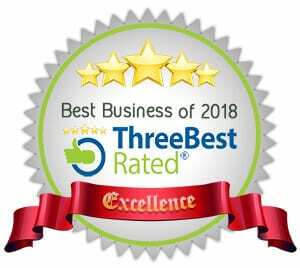 Three Best Rated® is an independent company that evaluates businesses in any city and handpicks the top 3 local businesses, professionals, restaurants and other major industries to make choosing simpler. Three Best Rated® aims to display businesses that are verified by their employers based on the business’ reputation, reviews, history, complaints, ratings, nearness, satisfaction, trust, cost and general excellence.